Have you seen Atrix’ new Omega Cordless Immediate Containment Vacuum? This portable industrial vacuum offers 190-watts of cleaning power with low-noise (67 decibels) output. The VACO22VDC ULPA vacuum provides immediate containment (perfect for hazardous particulate applications), self-storage, a contained accessories area, built-in full indicator light, and brushless motor. The Omega cordless rechargeable vacuum includes a 30-minute run time (battery pack recharges in just one hour). 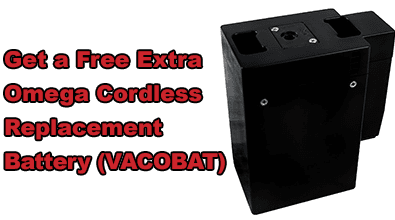 And with our limited-time promo (expires June 30, 2019), you can get an extra battery for free with your purchase of the Atrix VACO22VDC. Just enter the coupon code FREEBATTERY at checkout and the extra battery will be automatically added to your order. Visit our Atrix Omega Cordless Immediate Containment Vacuum Promo Page for info about this new Omega vacuum cleaner and how to get your free battery with purchase. You may also contact us via email or phone (800-966-6020) for large orders or other inquiries. We also offer live chat customer service on our Web site.